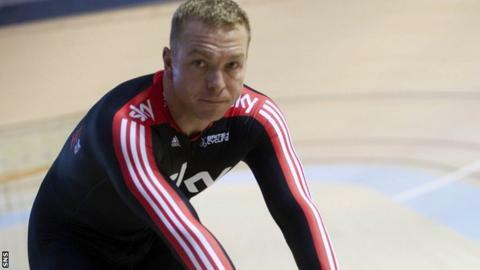 Sir Chris Hoy says competing at the 2014 Commonwealth Games in Glasgow depends on his fitness. Asked whether he would feature in two years' time, the 36-year-old said: "I hope so - if I can physically do it then I'll be here." Speaking at the city's velodrome named after him, the six-time Olympic gold winner said the venue was inspirational. "It's amazing to come here and see Scottish cycling flourishing," he said. The Scot is unlikely to carry on for a fifth Olympic Games in 2016, but track cycling's greatest-ever sprinter would love to compete at the Glasgow velodrome. "It's an incredible facility and I never dreamt we'd have anything like this," he told BBC Scotland. "When you come in here (to the arena) and see it, you can just imagine what it's going to be like and how fantastic the event will be." The Sir Chris Hoy velodrome forms part of the £113m Commonwealth Arena close to Celtic Park in the East End of Glasgow. And Britain's most successful Olympian will be on his bike for charity races taking place during the Scottish Track Championships this weekend. "To have this facility here now in Scotland, it guarantees the future of track cycling for the country because until this point we've only had Meadowbank and Caird Park and they are both outdoor tracks, so as soon as it rains you can't use them," added Edinburgh native Hoy. "But having this velodrome means that we now have a chance to really develop the sport, to host major championships, to train future champions and to let school kids and club level cyclists come down, try it out and enjoy it. "It's not just about producing champions, it's about getting more people interested and involved in the sport and enjoying it, and that's what can happen here." The Sir Chris Hoy Velodrome will host a round of the UCI Track World Cup series in November.